You are currently browsing the The Pet Product Guru blog archives for the day Friday, February 8th, 2019. Since I have lost my beloved cat Molly, I have pondered this question many times. Some Christians say that the bible doesn’t mention pets getting into the kingdom of God and this really disturbs me. Personally I believe that Heaven supposed to be a perfect, happy place. Pets are a huge part of human life. Would God eliminate our furry friends from entering his kingdom? I think not. I believe that everything we know and love will be included in the kingdom of Heaven. Guideposts says this on the subject. God goes on to say that his covenant with “all flesh” shall never be “cut off”—a strong suggestion that animals will not be excluded from his dealings with the world. Jesus filled his teachings with references to animals. His promise in Matthew and Luke that not even a sparrow falls to earth without God’s knowing it subtly but powerfully suggests what every grieving pet owner feels: God refuses to forget a single one of his creatures, no matter how small or seemingly insignificant. What about the argument that runs: “Animals can’t go to heaven because the Bible says they don’t have souls”? Norm Phelps points out in his book, The Dominion of Love that the Hebrew term repeatedly used to describe animals in the Old Testament is nephesh chayah. Why did the Bible’s english translators take such pains to use different terms for the souls of animals and people, when the Hebrew of the Old Testament repeatedly uses just one? Probably because they were concerned not to contradict Genesis teaching that humans alone are created in God’s image. But to acknowledge that animals have souls isn’t to usurp the unique place of humans in God’s creation—as the original Hebrew makes clear enough. So expect to see your departed. 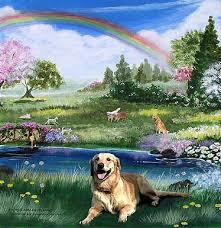 loved furry friends when you cross over that bridge into the kingdom of God! Catch the best oldies all the time on our radio station: Edgewater Gold Radio–the best mix of oldies from the 50s through the 80’s. Ask Alexa to “Play Edgewater Gold Radio or listen fro our website Edgewater Gold Radio. com. add comment Comments Off on Do Pets Go To Heaven?